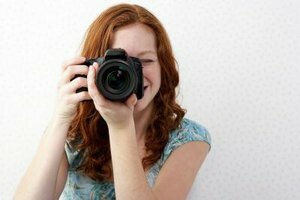 Explore her passion for photography with her. While there's nothing wrong with the typical, tried-and-true dates, you can make a bigger impression and have a ton more fun by coming up with a more creative date, especially one that considers your date's interests. If the girl you are dating loves photography, you just may impress her by planning a date with a photography emphasis.Tell her to bring her camera along for a one-of-a-kind date she won't soon forget. Take her to the nearest photography-based art gallery or art museum, where the two of you can marvel at professional photographs of famous, world-renowned photographers, or local, up-and-coming photographers. If you don't live near a professional gallery or a museum with photography art, check to see if any of the college campuses near you have art and photo galleries that display student work. If you don't know a lot about photography, take the opportunity to ask her questions about the different photographs you see, which shows that you are taking a genuine interest in something she cares about. Take your date to a photography class. Choose a class that will teach her something new, but that is not too advanced that you can't follow along. For instance, you could find a photography class that teaches you how to take fantastic photos using just a camera phone. Consider an outdoor photography class as well, where you can enjoy the great outdoors while learning the best ways to capture it in a photo. If you are able to develop and take the photos home the same day, you can admire and compare each other's work over lunch or dinner. Take a tour around your town or city and document the entire date with pictures. The two of you can take turns photographing each other at major monuments or tourist attractions, or find people to take pictures of the two of you together. Have fun with it by doing silly poses or faces. Another idea is to take your date somewhere secluded with a scenic view to take pictures and experience a quiet, romantic moment. Have the pictures printed the same day and get two copies made so you both can take home the memories of the day. Plan a scavenger hunt for you and your date that requires the two of you to take pictures of certain people, places or things. You can either have a friend create a list based on local attractions, or you can find a generic photography scavenger hunt list online that would work for any town or city. Tasks could include taking a photo with someone else's dog, hugging a stranger, or with a receipt for pizza at the mall. Set a time to complete all of the tasks and see how much of the list you can complete.